It’s true that entering the ministry is largely about what’s in your heart and the devotion and spirit you bring to your work, but you’ll also need a formal education to do well in the field. As Proverbs says, fools despise wisdom and instruction… it’s undoubtedly true that the more familiar you are with biblical truths, the better prepared you’ll be to offer counseling, compassion, and ministry to those within your circle of influence. This foundational knowledge comes from a bachelor’s degree in ministry, biblical studies or theology. There are many degree options in the United States today for anyone whose path is leading them to religious service, either as a missionary, counselor, pastor, or in the many ancillary roles that exist for offering succor to needy populations, both domestically and abroad. This very fact can make exploring all the options and weighing all the factors an almost impossible task for anyone to take on alone, and this is what makes resources like this one so valuable. You’ll find degree specializations here ranging from homiletics to wilderness ministry leadership to evangelism and missionary work. We went the extra mile in identifying programs that give you a lot of unique choices, but they all have one very practical factor in common: all offer tuition rates that are considerably lower than other similar programs. Many of these programs are impressive in terms of scope and the quality of their education, but cost was the feature that trumped all others in the analysis we performed. We scoured the tuition data of all the accredited bachelor’s programs in ministry, biblical studies and theology to identify the ones that beat the average tuition costs in their respective states. Because your path will not be one that is strewn with worldly riches or the trappings of wealth, it’s only natural that affordability is going to be among your top concerns when looking for a bachelor’s degree. No matter what your calling, you’ll find a program you can afford somewhere on this list. Cost is a major consideration, but it isn’t the only one. We wouldn’t expect anybody to make a final decision about where to spend the next four years preparing for a life of Christian service by just looking at a price tag. Whether you’re looking at your bachelor’s as a stepping stone in preparation for a graduate degree, or the one big step you take before making the transition to your professional life, you’re going to need to know about a lot more than just tuition rates before enrolling. That’s why we give you everything that any aspiring undergraduate in your position would want to know. All three are recognized by CHEA, the Council for Higher Education Accreditation and the United States Department of Education, and they maintain high standards through ongoing evaluation and stringent requirements for instructors, curriculum, and administration. Because serving in the ministry is an intensely personal calling, it’s important that your degree program allow you to customize and personalize your curriculum to align with not only your faith but also your particular sense of service. That means offering plenty of elective options, minors, and tracks to graduation that keep you on your own path. This could very well be the single most important factor for you if you’re looking for a program with a highly specialized area of focus. You can be sure we included all those details for every one of the programs that made our list. Other factors that would help a program fit into your personal plan and path have to do with scheduling options and the flexibility that comes with being able to take some or all of your courses online. Many online courses allow you to time-shift your studies so that you can dig into your course content when and where it’s most convenient for you to do so. This is a massive boon if you are among those students who have to hold down a regular job or other commitments while you are attending school, and opens the door to educational opportunities that would otherwise be entirely unavailable. Because there is such a broad range of specializations and fields of study in divinity, there’s no such thing as a one-size-fits-all degree plan. That’s why we dug into the details to isolate the unique – and harder to quantify – points that can make all the difference for students like you. Special programs for spiritual development, extracurricular social activities organized by the school or student organizations, or outstanding alumni networks that can plug you into a community of like-minded and compassionate graduates for advice long after commencement day… these are all features we’ve noted since we know they could be key to helping you make your final decision about the program that’s right for you. Finding the perfect match for you is going to be a matter of considering everything from a school’s unique culture to the particulars of the specific program and how it will prepare you for the path ahead. We can’t guarantee that every program on this list will meet your exact requirements, but we can assure you that what you’ll find here are the most affordable options in America, all backed by the assurance of quality and academic rigor that comes with accreditation. We’re confident you’ll find the right program for you and your budget right here on this list. Huntsville’s undergraduate programs in ministry, mission and evangelism, and Christian education don’t just offer an attractive price tag; they provide the solid preparation you need to achieve your career goals in ministry, missionary work, and more. And thanks to primarily evening courses, you’ll be able to complete your bachelor’s degree while you engage in fulfilling experiences designed to enhance your education. Choose Huntsville for your bachelor’s degree and you’ll have access to the school’s exceptional student counseling and peer mentoring services, both of which are designed with your academic and personal success in mind. Evangelia University’s BA in Biblical Studies is the affordable and comprehensive degree program you need to prepare you for work in ministry, evangelism, missionary work, counseling, and more. You’ll not only appreciate this program’s low price (more than $20,000 below the state average) but also its flexible design that includes your choice of elective courses. Plus, you’ll also have the opportunity to complete your program on-campus or fully online – the choice is yours! Whether you complete the program in-person or at a distance, you’ll still enjoy the same highly qualified instructors who are there to offer mentorship, guidance, and support throughout your educational journey. At more than $10,000 below the state average for similar bachelor’s programs in ministry at accredited institutions, the BA in Ministerial Studies at Hobe Sound Bible College is an outstanding value in Christian education. For students with aspirations of a career in ministry, this program is expertly designed to prepare you to become a pastor, evangelist, and other type of church leader. And thanks to several options to minor in relevant areas like TESOL and Intercultural Studies, you’ll be able to easily custom tailor your program to meet your vocational goals. Need even more flexibility? This program can be delivered fully online, too! This is the affordable, Bible-centered education you’ve been searching for! Pensacola Christian College doesn’t just deliver a robust, comprehensive Christian education through its BA in Bible program – it delivers affordability, too! In fact, this program is priced nearly $10,000 below the state average for similarly designed bachelor’s programs. As a student of Pensacola Christian College, you’ll also enjoy connecting with your peers through a variety of off-campus outings throughout Alabama and Northwest Florida and through on-campus social activities and special events like fine arts performances, concerts, athletic events, and Sunday Reflections. Choose the BA in Bible here and you’ll be able to choose from one of four concentrations for a truly customized course of study. Since 1974, Pensacola has been preparing students for a life of Christian service, growing from a student body of just 100 to more than 5,000. Luther Rice College and Seminary’s BA in Religion – Biblical Studies program is everything you’d want in a Christian-based education – and more! In addition to a program cost that’s more than $6,000 less than the state average for similar bachelor’s programs at accredited institutions, this program offers a fully online, on-campus or hybrid course of study that provides you with outstanding flexibility and convenience. And while this program is distance-based, you’ll still enjoy outstanding support services and resources, including personal attention from the school’s top-notch faculty. Choose Luther Rice and you’ll be part of a respected institution that’s been educating Christian men and women for more than 55 years. 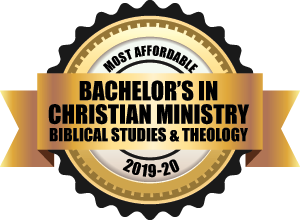 Faith Baptist Bible College’s bachelor’s programs come in strong with a total cost that’s nearly $5,000 less than the state average for theology-based bachelor’s programs! The excellent selection of faith-based programs, combined with fantastic concentration options offer a truly customized course of study. This means that you’re certain to find a program that fits your career goals and personal aspirations. Faith Baptist’s vast alumni network in 48 states and 32 countries is proof positive that this school’s mission of preparing vocational Christian workers and ministry leaders to spread the Word of God throughout the world has been highly successful. Superb program offerings and a total online program cost that’s nearly $8,000 less than the state average for similar ministry programs are the hallmarks of the bachelor’s degree offerings at Moody Bible Institute, a leader in undergraduate Christian education. From its inception in 1886 to today, the Moody Bible Institute has been offering students only the most relevant and comprehensive Christian-focused programs. As a distance-learning student, you’ll enjoy a variety of course delivery options, including independent study (print correspondence format courses), online (Internet-based, eight-week courses guided by Moody faculty), online self-paced (online programs that can be completed in 16 weeks at your own pace), or in-person learning at the Ohio extension site in Cleveland. And if one of these options doesn’t align perfectly with your scheduling needs, you can design a completely customized course of study by choosing from two or more distance-based delivery methods! The Veritas Baptist College Bachelor of Ministry is not only a very affordable program priced nearly $10,000 below the state average for theology-based bachelor’s programs, it’s also the comprehensive course of study you’ll need to effectively serve in vocational ministry. Thanks to the fact that you can choose from one of five tracks, you’ll be able to custom tailor your program to suit your vocational goals and personal interests. Veritas Baptist is home to an outstanding faculty of leaders who also serve as trusted and respected mentors that guide you throughout your educational and spiritual journey. Whether you’re looking for an on-campus or online degree to drive your call to ministry and leadership, Kansas Christian College has you covered – all at a price that comes in a lot lower than the state average for similar programs! In addition to its comprehensive selection of Christian-based programs, Kansas Christian College ensures its students grow spiritually during their time here. Weekly chapel services, guest speakers, and one-on-one meetings with the campus chaplain are all part of this school’s commitment to spiritual development. With a total program cost that’s nearly $17,000 less than the state average for similar programs, the value of Simmons College of Kentucky’s BA in Religious Studies simply can’t be beat. With a focus on preparing the next generation of students for ministry or Christian service, the BA in Religious Studies features a solid foundation that’s complemented with a focus on faith in an urban context and the African-American spiritual and intellectual tradition. As a student here, you’ll also enjoy the best in student support and guidance, thanks to the school’s Student Resources Center, which offers one-on-one tutoring, writing labs and seminars designed to support student growth. Northpoint Bible College’s BA in Bible and Theology is affordable, comprehensive, and balanced, providing students like you with a solid education focused on the Bible and its theological framework. As a student of the BA in Bible and Theology program, you’ll also choose a second major, something that allows you to customize and focus your course of study to align with your vocational interests. The result – a truly well-rounded program that’s supported by a 90-year-old institution with an unwavering mission to train students for Pentecostal ministry. Whether you’re looking for an immersive, on-campus experience or the flexibility and convenience that an online education offers, Northpointe Bible College has the program for you. Faith Theological Seminary’s BA in Religion- Biblical and Theological Studies is designed to prepare you for church and ministry without burdening you with excessive debt. This program, which is priced at more than $17,000 below the regional average for similar programs, may have made our list for being affordable, but its design and curriculum options deserve some recognition all by themselves. As a student of Faith Theological Seminary, your educational experience will be rich and fulfilling, complemented with everything from fundraising activities to socials to Student Government events to holiday celebrations. Grace Christian University’s undergraduate offerings in biblical studies and leadership and ministry are nothing short of superb. The on-campus BS in Biblical Studies features your choice of six concentrations and a foundation in theology, the Bible, and ministry principles and practices to prepare you for vocational Christian ministry. Just some of the coursework of this program includes Old and New Testament Literature, Christian Life and Service, the Mission of the Church, and Systematic Theology. Choose Grace Christian for your bachelor’s degree and you’ll be part of a tight-knit community that features plenty of student events, clubs, activities, study groups, and cross-cultural ministry trips. Bethlehem College and Seminary’s Bible-focused, God-centered bachelor’s degree programs are proof positive that outstanding degree programs don’t have to cost a fortune. Priced nearly $19,000 less than the state average for similar bachelor’s programs in ministry at accredited institutions, both the BA in Biblical and Theological Studies and the Bachelor of Theology feature a small cohort of students who work and study together under the guidance and mentorship of a dedicated faculty of pastor-professors. As a student of Bethlehem College and Seminary, you’ll receive the Serious Joy Scholarship worth $10,000 each year, bringing the total cost of the program down to just $24,000. *Additional teaching site located in Washington D.C. Outstanding course delivery includes on-campus, online, and blended options, including study at the school’s teaching site in Washington D.C.
Midwest University’s BA in Theology offers a broad foundation in ministry and a truly affordable program cost that comes in more than $18,000 less than the state average for similar bachelor’s programs in ministry at accredited institutions. Choose Midwest and you’ll be able to learn at the school’s main campus, which is located in the St. Louis metropolitan area, at the school’s teaching site in Washington D.C., and/or through a combination of blended courses and online study. Whichever delivery method you choose, you’ll enjoy a superb academic environment that features small class sizes, outstanding collaboration and communication, and superb guidance from a dedicated faculty. All students of Midwest participate in the school’s Christian Service Program, which includes volunteering at local churches and within the community. Southeastern Baptist College’s BS in Church Ministries boasts a fantastic tuition rate, with a total program cost coming in at more than $19,000 below the regional average for similar programs. On top of that, you can expect a solid course of study that boasts small classes, personal attention, and a dedicated faculty of professors. Choose Southeastern Baptist College and your superb educational experience will also extend beyond the classroom, where you’ll enjoy fellowship and interaction with your peers through organizations like the college choir, the Ministerial Alliance, the Student Government Council, and more. Ministry-focused instruction that’s both comprehensive and affordable? Yes, it is possible, thanks to Montana Bible College’s BA in Biblical Studies, which is priced more than $3,000 below the state average for bachelor’s programs in ministry. This fulfilling program features ministry training both inside and outside the classroom, providing students with a unique blend of local church experiences, Bible exposition courses, and a choice of concentrations. And with a location in rural Montana, this program is able to focus on rural and small town church ministries – the only Bible college in the country to offer this focus. Carolina Christian College’s BA in Ministry offers convenience and affordability for adult learners like you! In addition to being extremely affordable – about $12,000 less than the state average for theology-based bachelor’s programs – the BA in Ministry features classes that meet just twice a week, in the evening. This kind of flexible scheduling allows students to continue to maintain their personal and professional responsibilities while earning their degree. Choose this program and you’ll complete a core in Biblical Studies and Ministry, along with a customized curriculum with your choice of concentration. You’ll also be part of a history of excellence and tradition at CCC, the oldest African-American bible college in North Carolina’s Triad. Summit Christian College is what value in undergraduate Christian education looks like! Priced nearly $23,000 less than the state average for similar bachelor’s programs in ministry at accredited institutions, both the BA in Biblical Studies and the BS in Ministry Studies provide you with a solid course of study designed to prepare you for ministry positions, missions work, or graduate school. The competitive tuition rates offered here are part of the college’s overall goal of providing students with the best opportunity to graduate debt-free. Choose Summit Christian for your bachelor’s degree and you’ll enjoy the school’s beautiful campus, complete with a modern computer lab and well-equipped classrooms. A host of exciting, theology-based bachelor’s degrees and an affordable tuition rate that comes in more than $3,000 below the state average – these are just two of the reasons why God’s Bible School and College got our attention! Whether on-campus or online, these programs are designed with today’s ambitious undergraduates in mind. You can expect the best in student support thanks to resources like the online library services, academic advising, and Student Success Center, which offers services related to technology support, academic success, time management, test preparation, and more. Family of Faith Christian University’s BA in Church Ministry is where you’ll learn to minister the Word of God through preaching and teaching. Whether you’re looking for an immersive, campus-based experience or a convenient, online course of study, Family of Faith Christian University has what you need to succeed – all at a truly affordable price! The BA in Church Ministry is fully customizable, offering a number of on-campus and online concentrations designed to allow you to focus your degree on your career aspirations and vocational interests. The online program is offered through All Nations College, Family of Faith’s distance-education program. Choose this program and you’ll take a combination of courses through both Family of Faith and All Nations while you learn under the same dedicated faculty. Penn View Bible Institute is value epitomized. Priced nearly $35,000 less than the state average for bachelor’s programs in ministry, the bachelor’s offerings here are nothing short of impressive, providing a super course of study aimed at a variety of Christian-focused vocations while offering one of the lowest tuition rates in the nation. Penn View Bible Institute also understands the importance of a well-rounded educational experience, which is why students here have access to a variety of organizations and activities designed to complement the rigorous academic component of this program. Just some of the activities here include intramurals, worship at local churches, school picnics, and monthly events. Founded by the African Methodist Episcopal Zion Church in 1894 as the Methodist Institute, Clinton College is a time-honored institution that continues to produce the next generation of Christian leaders and change makers, and its BA in Religious Studies is no exception, preparing students like you to develop a deep understanding of world religions and the many ways Christian education and service contribute to society. As a student here, you’ll enjoy one of the best value programs available, with a total tuition cost that comes in nearly $40,000 less than the state average for similar bachelor’s programs. You’ll also have access to superb student support services aimed at ensuring your academic success. Designed to prepare students for leadership positions in the church and the world, the John Witherspoon College BA in Christian Studies is a well-rounded course of study that also comes with a super low price that comes in more than $22,000 below the regional average for bachelor’s programs in ministry at accredited institutions. Choose the BA in Christian Studies and you’ll enjoy learning under a faculty of recognized scholars in an intimate learning environment. As part of your degree, you’ll also complete a Basileia Mission, a special project that may include an internship, a mission trip, or involvement in an approved ministry. The Crown College of the Bible Bachelor of Biblical Studies – Pastoral Ministry offers one of the nation’s leading ministry training programs. Priced nearly $23,000 less than the state average for similarly designed bachelor’s programs at accredited institutions, this program offers aspiring ministers and church leaders like you with a truly affordable course of study that won’t burden you with excessive debt. As a student here, you’ll study under a dedicated faculty with extensive ministry experience while you begin to put classroom theory into motion through exciting field experiences of your own. In fact, the Temple Baptist Church has more than 100 ministry opportunities that include studying abroad at one of their international learning sites, singing with the Crown College Choir, serving in an internship in the U.S. or overseas, traveling as a New Testament Church Pioneer, and much, much more. The Rio Grande Bible Institute Bachelor of Theology will prepare you to work as a leader in the service of your fellow Christians, and its super low cost – nearly $39,000 less than the state average for similar ministry programs – will ensure that your educational journey is an affordable one. In fact, this program is not just one of the lowest priced programs in Texas, but in the country, as well. And if you need additional Spanish language instruction, the school also offers a nine-month program of concentrated language instruction for Christian workers who plan to minister to Hispanic communities. The Ivy Christian College BA in Biblical Studies is robust and comprehensive, featuring classroom lectures, instruction, demonstrations, tutorials, and library research in a dynamic, intimate learning environment. This program of study, which is focused on the interpretation of the Old and New Testaments, is priced for the budget-conscious student who doesn’t want to be burdened with excessive debt after graduation. It also comes with outstanding student services, including the Division of Student Affairs, which offers programs, initiatives, and services designed to enhance your academic experience, and tutoring services and career services designed to ensure your educational journey is a successful one. Your path to Christian ministry is wide open, thanks to Faith International University’s BA in Religion, a comprehensive and affordable course of study featuring a blend of classroom theory and applied studies. The broad Biblical and theological foundation of this program is designed to prepare you for a variety of Christian ministry and leadership positions, while the option of both online and on-campus courses ensures the best in flexibility and convenience. This program also boasts an impressive, 14:1 student-to-faculty ratio, a great selection of program concentrations, and the option to complete the program entirely in Korean. Bethany Global University is committed to student success, and that means offering free tuition for all undergraduate students. That means you financial responsibility is limited to just room and board (required) for all four years. Its BA in Intercultural Ministry Studies fits perfectly with the school’s long history (60+ years) of training missionaries. The first two years of this program are focused on biblical and theological study, while the last two years are spent participating in a global internship, which includes missions work with partners around the globe. You’ll live overseas for 16 months while you learn a foreign language, study in different social structures, and learn among Christians. Just a few of the global internship sites include Central Asia, Thailand, France, and Kenya. In addition to this comprehensive course of study, you’ll also have the opportunity to custom tailor your program through your choice of four minors. The bachelor’s offerings in ministry and counseling at Central Christian College of the Bible are nothing short of superb. In addition to outstanding on-campus programs, this school also offers an online program that features eight-week intensive courses and the convenience and flexibility of asynchronous course delivery so you can take in the course content at the time and place that works best for you. On-campus tuition is free here, thanks to a 100% full tuition scholarship for all students (valued at $7,500 per year). This means you’ll only need to cover the cost of room and board, saving you thousands when compared to the total cost of similar programs.